I first ran into Keith Windschuttle at San Francisco Airport well over a decade ago. As I walked into Brentano’s Book Store, while waiting for a connecting flight, there he was, or at least his name was, presiding over a huge centre-display of his book — The Killing of History. Who the heck was this Australian historian and why was his book being so widely acclaimed in a waiting-lounge bookshop half-way around the world from his home? And why was this book, which was being promoted as “… one of the most important defences of the West written in the last twenty years”, virtually unknown in Australia? Glued to the book for the next 14 hours of the flight to Melbourne, I can honestly say that neither life (nor history) has quite been the same since. It was one of those mind-changing moments that very rarely comes your way, but when it does there are no regrets. The moment is best described as enlightenment. In 1997, one reviewer of The Killing of History, Victor Davis Hanson of The Weekly Standard said, “We need more Keith Windschuttles, hundreds of them.” Mr Hanson, I’m afraid, vastly underestimated the need. 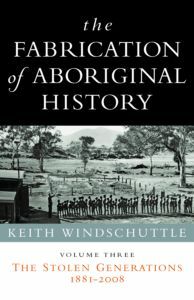 In his latest book, The Fabrication of Aboriginal History — The Stolen Generations (1881-2008) Keith Windschuttle continues the battle to save the soul of the nation’s history in what can only be described as a tour de force in both academic research and masterful writing. The stripping bare of the preposterous notions of the “Stolen Generations” will, in time, be seen as THE defining moment of correction. When historical reality collided with ideological spin. Thankfully, historical reality, resoundingly won the day. What a shabby thirty-odd years it has been as the self-appointed guardians of the nation’s history tear and rend at our country’s past. Not with historical facts, but confected campaigns and imagined events. With distorted statistics and selected accounts of the few to give a totally dishonest account of the many. In the most kindly of terms it can only be described as having been a propaganda campaign of epic proportions. 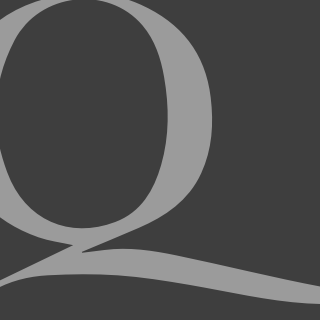 While there were obviously individual cases of trauma and hardship, the broad canvas painted by those who would deceive, skilfully hid a totally different story. In the late seventies and early eighties of the last century, Australians awoke to find their country pronounced racist and genocidal, with a near-history of stealing 50,000 Aboriginal children from their mothers breasts or sides. We had also wiped out the Aboriginal population of Tasmania, massacred about, oh say, 24,000 Aboriginal people on the main-land, and were apparently determined to keep the present Aboriginal people in abject poverty. We were also all about destroying Aboriginal culture and history. We were a wicked people. And this wasn’t the work of just early settlers — we (that is all non-Aboriginal Australians) were to blame. We all had a “collective guilt”. Creating a sense of national guilt was the objective. And it succeeded … nearly! Broken down, the black deaths were something in the order of: 39 fighting off attacks on isolated shepherds/workers/settlers; 29 by immediate pursuit parties following attacks; 12 during perceived or actual threats; 24 brutal murders of innocent Aboriginal people by convicts/sealers/individuals and 9 for unknown reasons. The charge of genocide simply faded away. In this new book, Volume Three — The Stolen Generations, once again the facts get in the way of good apology. Once again the revealed numbers tell a completely different story to the one used to denigrate the nation. Of children allegedly “stolen” from between 1881 and 1970 the number, on examination, falls from 50,000 to about 8250. The key words that emerge are “taken into care”. Most Aboriginal children were taken into care because they were in some sort of danger. Violence, neglect, illness were the main reasons followed by perceived opportunities for work, education or advancement. Sound familiar? In the SBS Television series First Australians viewers were told confidently by the script-writers Beck Cole and Louis Nowra that an estimated 50,000 Aboriginal children were removed from their families. “Most were under five” the series told its viewers. In the year depicted in the film Rabbit-Proof Fence (1931), the records show that only 4 children were taken into care by the Chief Protector of Aboriginals in Western Australia. Three of those children were depicted in the film. Indeed, according to Keith Windschuttle, if 20 “unattended” Aboriginal children were taken into care in one year it would be considered abnormally high. In January 2008 the Tasmanian government announced it would pay 84 Tasmanian people $58,000 each because they claimed to be members of the Stolen Generations. What was truly weird about the Tasmanian case was that this was the one state where it was legally impossible for anyone to be a member of the Stolen Generations. Since 1876, when the last Tasmanian Aborigine, Truganini, died, the Tasmanina government could not possible have been guilty of removing any child from its home ‘simply on the basis of race’… after that date  Tasmanian governments presumed all the Tasmanian Aborigines had died out. He goes on; “Rather than acting for racist reasons, government officers and religious missionaries wanted to rescue children from welfare camps and shanty settlements riddled with alcoholism, domestic violence and sexual abuse.” Most of the children had a white father and were not necessarily accepted by tribal elders. Without any doubt the same can be said of Keith Windschuttle’s latest book, The Fabrication of Aboriginal History: The Stolen Generations —1881 to 2008.